After being recommended this place, I went for a flying visit for lunch with a colleague. Checkpoint was bustling but there were a few free tables. The menu is surprisingly extensive, with salads, ‘Philfy’ rolls, subs etc. After toying with the idea of going for a roll, I decided to go for a large salad (well, I was going out for dinner too!). I chose the quinoa, apple, beetroot, pomegranate and halloumi salad. My friend also chose a salad – this time a flat iron steak salad with baby corn, spring onion kohlrabi and chimichurri. We didn’t wait long for the food and they arrived in ‘interesting’ tableware. I had been pre-warned that @wewantplates would have a field day here. My salad came in a bowl more usually used for mixing and my friend’s salad came in a large tray. This seemed a little pointless, particularly as my bowl kept swivelling round and it was not easy to get a knife and fork into. That being said, the salads themselves were good. My halloumi was plentiful and full of flavour, coated slightly in a crumb for added texture. The beetroot was fresh and worked nicely with the apple. The quinoa added a good base. My only quibble was the salad leaves were of the spindly type. I prefer a more leafy salad. On the other side of the table sat a beautiful looking salad. I was having major salad envy. The steak was cooked perfectly on the rare side. The chimichurri was poured over the meat and salad leaves. This was really a good looking salad that tasted as good as it appeared. We were both impressed overall with Checkpoint. We certainly intend to come back. Cost £21 for two large salads and two soft drinks. Our trip to Hula was unplanned but I had seen some nice photos of their food on social media so was happy to try it. When we visited it was very busy but it was a Saturday on a bank holiday weekend and Hula is situated just by Grassmarket so this was inevitable. We opted for three smoothies; a Blue Hawaiian, a Betty Ford and a Sunshine in a Cup. I went for a Cajun chicken wrap, my sister chose a ham and cheese bagel and her boyfriend went for a Brie, cranberry and tomato bagel. The smoothies arrived first. My sister’s boyfriend was disappointed that the Blue Hawaiian wasn’t actually blue. Both his and mine tasted primarily of their banana base but we both enjoyed them. My sister’s Sunshine in a Cup was supposed to be peach, mango and orange but it tasted just of orange juice. This was a bit disappointing. Then the food arrived. They all looked good, although the side salad was dressed with a large amount of mint dressing. It was nice enough but risky as lots of people wouldn’t go for mint dressing. We all found the bottom of our wraps and bagels a bit overdone. A shard of my wrap actually skewered my gum! The wrap itself was generous and tasty enough, being bulked up by rice, mixed in with the chicken and veg. The other bagels were also nice enough, with the cheese oozing in both. We were a little underwhelmed by Hula. It was decent enough but nothing special and bit too much of a chaotic feel for us. I got a voucher deal from itison for a large sharing platter plus a mini bottle of prosecco each for £13. Pickle and Custard is situated on Lothian Road on a nice corner plot. We were welcomed and shown to a window table. Whilst this was nice, the tables were quite close together, which wasn’t ideal. It seemed that lots of other diners were also in with the deal. We got drinks and the platter was with us very quickly. This consisted of bread, salami, chorizo, Parma ham, a selection of cheeses, olives, tomatoes, peppers and a small salad. Whilst this sounds a lot, for two sharing, the amount on offer was a little disappointing. I would have been annoyed paying the full £15 (excluding drinks) and getting this. That said, all the food was good. The meats had great flavouring and the olives were delicious. The bread was lightly toasted but not as far as to call it toast. There were a nice choice of cheeses, but don’t expect mozzarella, brie or any other soft cheeses. 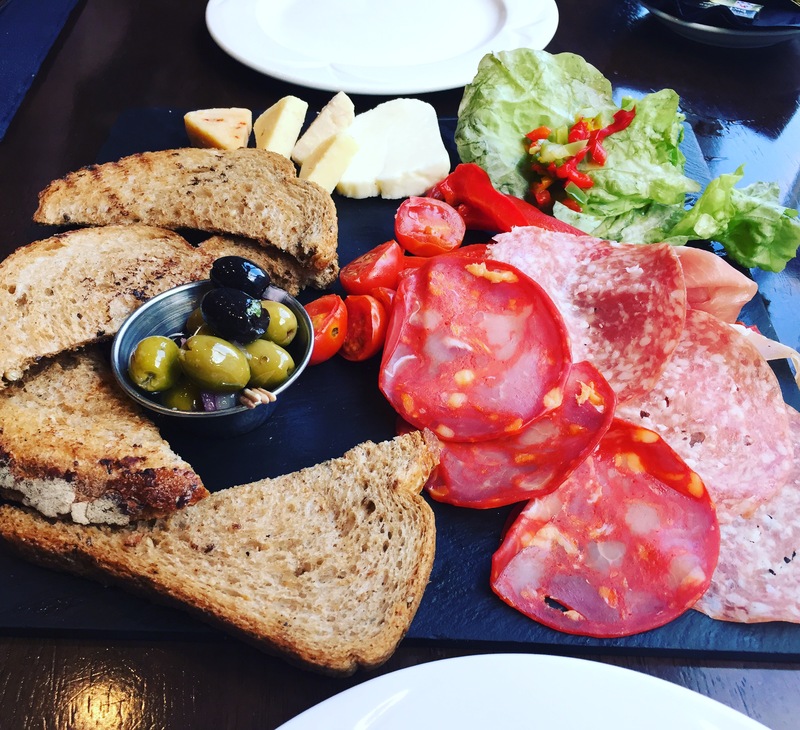 I would say that this platter is very much a stop gap between meals or a light lunch type platter – something to soak up the drinks. It certainly wasn’t what I would have considered ‘large’ when it was for two people. After finishing we were still starving. Once we finally got seen by a waitress, she brought over some menus for us, only to find out we needed to pick desserts from the counter. 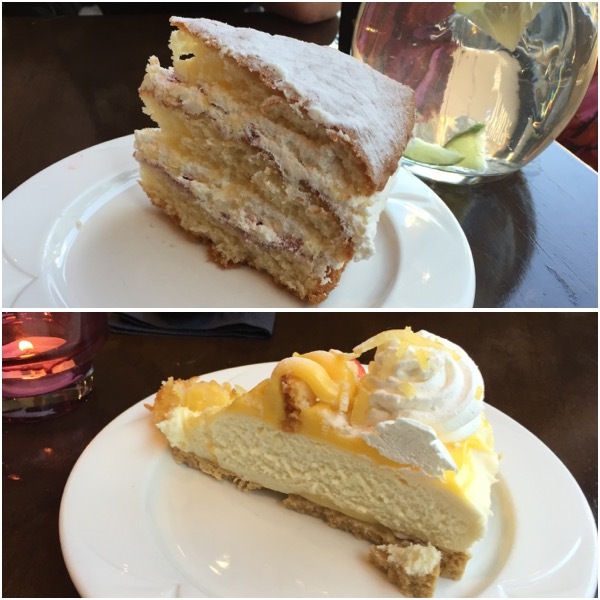 That done, we got a victoria sponge layered cake and a lemon cheesecake. These were both great and substantial. They were also both better value for money than the platter. Service again was pleasant but a bit on the slow side. I had wanted to like this place so much but left feeling underwhelmed. 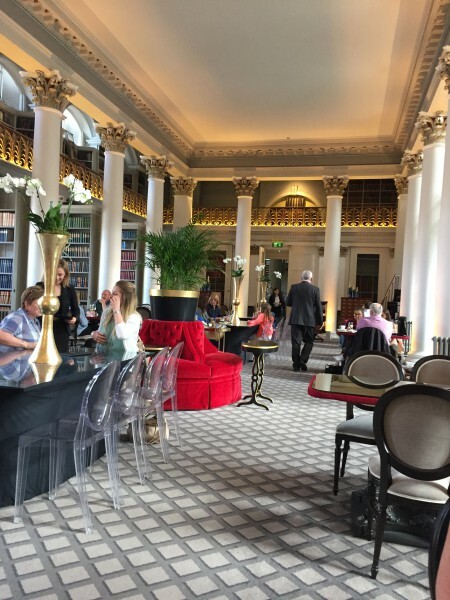 Again, Zomato had pulled a blinder and allowed myself and a friend to go and check out afternoon tea at the recently launched Colonnades based in the Signet Library on the Royal Mile. I have to say I was pretty excited about this, based on some of the photos I had seen from others who had been. The Signet Library is a beautiful room, long with high ceilings and lined with books. We were greeted by incredibly polite yet friendly staff, all whom were splendidly turned out. 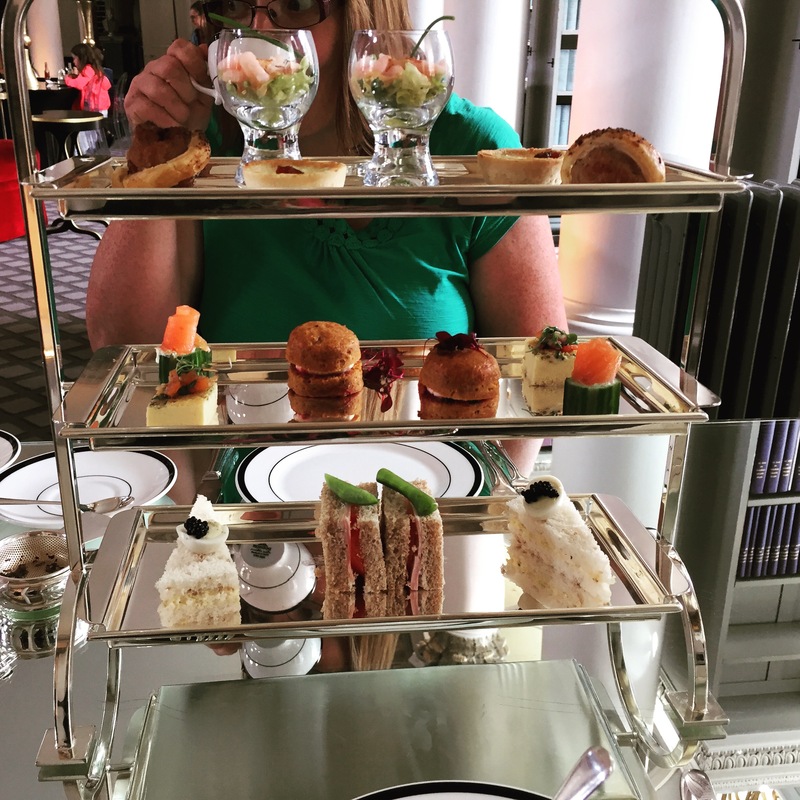 Although we had come for afternoon tea, we were able to peruse the menu not only to pick our choice of tea (or coffee if that floats your boat) but to see what other offerings they had. There were certainly some great options including sharing platters. 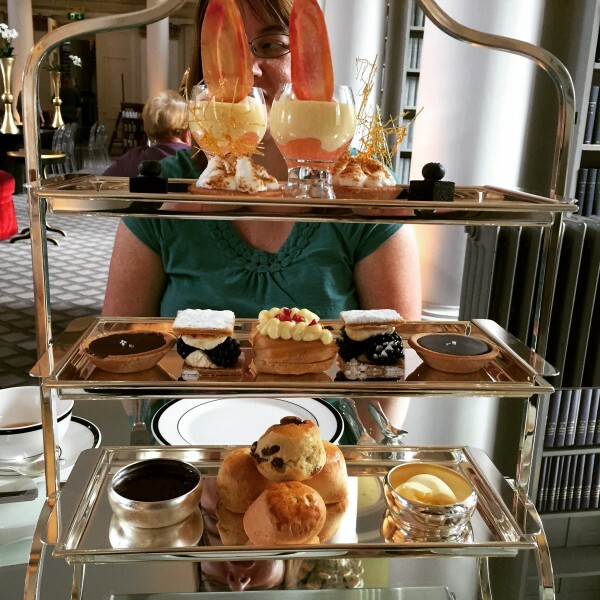 The waiter explained how the afternoon tea worked and then we ordered our teas. I am actually not really a tea or coffee drinker but don’t mind a fruit tea and there were a few decent choices on the menu. I went for a cherry and raspberry option and my friend went for a more classic Darjeeling. These were served in beautiful silver but they did leak a little on pouring, which wasn’t ideal. 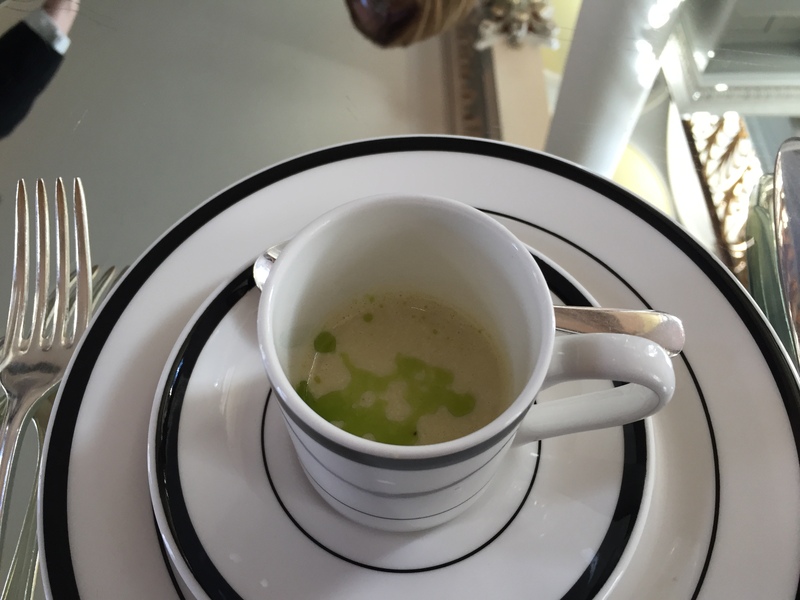 First, before the first of two (yes, two) stands of treats came out, we were given an amuse bouche of cullen skink. This was served in a dainty cup and saucer. This was packed with so much depth and flavour that I didn’t want it to end. If I hadn’t been there for the tea, I could have eaten a big bowlful of that. Then the first stand came out, which was filled with our savoury treats. There were so many things that I didn’t know where to start. In the end I decided that as I didn’t really like cucumber, I was going to eat that first. It was filled with a cream cheese and had a beautiful piece of salmon curled on top. 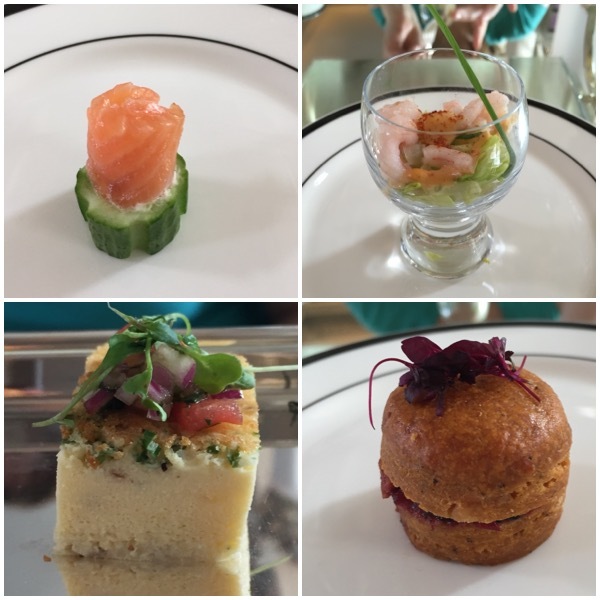 The salmon had so much flavour that I was surprised and didn’t find the cucumber half as traumatic! I then tried the prawn cocktail with marie rose sauce. The prawns were tiny but still tasty. The sauce really packed a punch though, which was a pleasant revelation. Someone must have spent a lot of time shredding lettuce so finely to keep the dish so delicate. Next up was a small slice of frittata which was creamy. There was a nice mini salsa of tomato and onion adorning the top, which meant that it has a freshness to it still. I then moved onto the cheese scone with cheese and bramble jam. 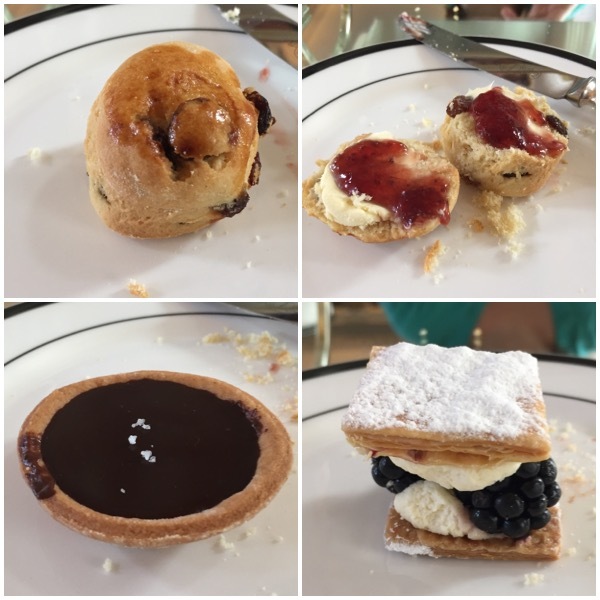 At first, I though the scone was a bit heavy but as it went on and developed it all made sense. Again, the taste you got from the cheese was incredible and quite moreish. Sandwiches were up next. 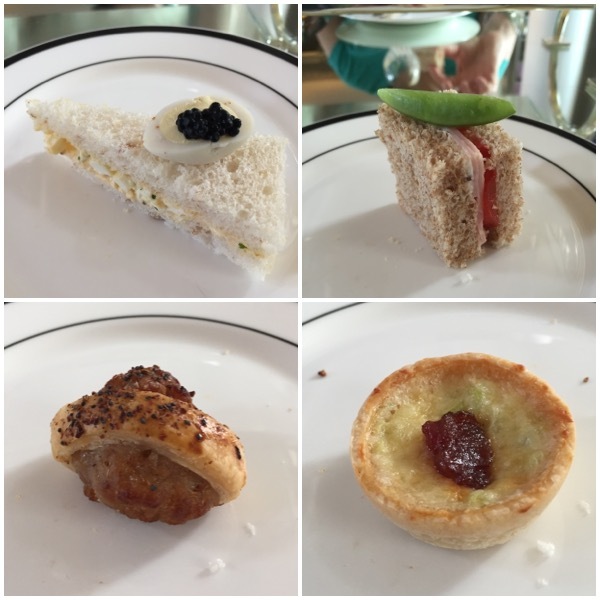 There were two on offer – an egg mayonnaise sandwich with brioche, quails egg and caviar and ham and tomato square with mange tout perched on top. The egg mayonnaise sandwich was light and fluffy, mainly due to the brioche. There were no crusts in sight. The egg was still identifiable in the filling without the chunks being too big. The ham and tomato sandwich was a little less exciting but tasty nevertheless. Moving onto the sausage roll, to keep it light they added just a ring of pastry around the meat. Inside the sausage meat was a mix of additional flavours that were surprisingly good. I am not sure why I had never thought about having extra elements within a sausage roll before because the idea is amazing. The last item left on the stand was a tartlet. This was creamy and rounded off the savoury section perfectly. We were given the option of having a little breather between stands but we were too excited to see what else we were having to wait. Again, the waiter went through everything that was on the second stand, although to be honest, I was surprised I heard anything he said as I was too busy drooling over the food! We were also told that if we couldn’t finish it all, they had nice little bags for us to take away any leftovers in (they obviously hadn’t seen me eating!). So, I started on this stand with the two types of scone; plain and fruit with clotted cream and jam (which had champagne in it for some added extravagance). Both of the scones were of a similar size to the cheese one from the savoury stand, which was great as scones can be very filling. These, however, were light and yummy. The clotted cream also managed not to be to heavy, which was an added bonus. I then approached the chocolate tart with caramel. I think the chocolate here had a high cocoa content as it had a bitter element which was evened out by the caramel. It was also quite gooey so made for a slightly messy (but fun) eat. A small sprinkle of sea salt on top helped maintain the balance. Moving on to the blackberry mille feuille, this was creamy and fruity as expected and the pastry gave a good crunch when I bit into it, which was very satisfying. Just watch out for the icing sugar on this one or you’ll be wearing a icing sugar moustache! Next up was the white chocolate and raspberry éclair. Although nice, this was probably the most sickly sweet out of the bunch, mainly due to the raspberry filling. This might be nicer with a compote type filling but probably then wouldn’t work as an éclair. Moving onto the blackcurrant jelly, this wasn’t jelly in the usual sense as it was not clear and had a grainy texture. This was because there was a high content of fruit within the cube which gave it a burst of flavour. I had saved the two I thought I would like the most until last. I firstly went with the lemon meringue pie. This has some pretty sugar work on top which was crunchy without having a burnt flavour, which can often be the case. The meringue was piped delicately and was a sticky delight. The lemon was zingy and was simply delicious. The last of the elements was a peach melba, presented in a small glass. This was cleverly constructed with a sharpness of fruit which balanced out the creamy vanilla notes. There was even some dried peach skin which not only looked great but tasted strongly of peach too. 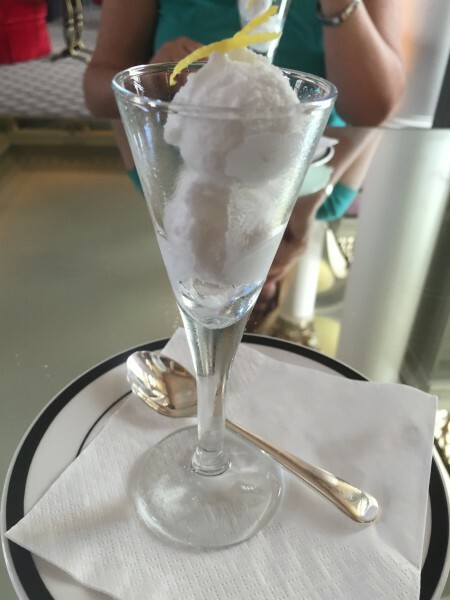 At this point, we thought we were done but then we were brought a refreshing lemon sorbet. 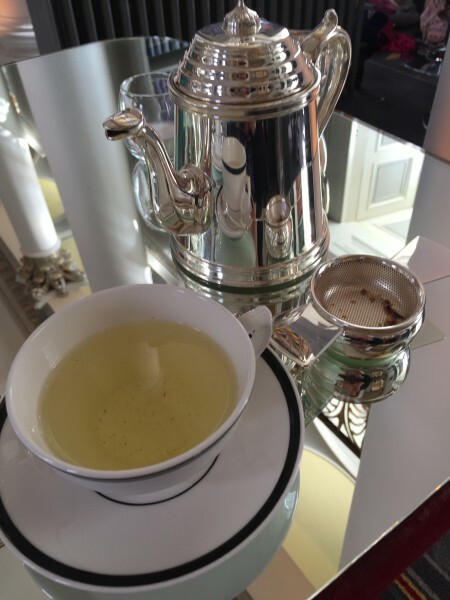 This was a perfect end to the afternoon tea as it was luscious, energising and left the palate cleansed. 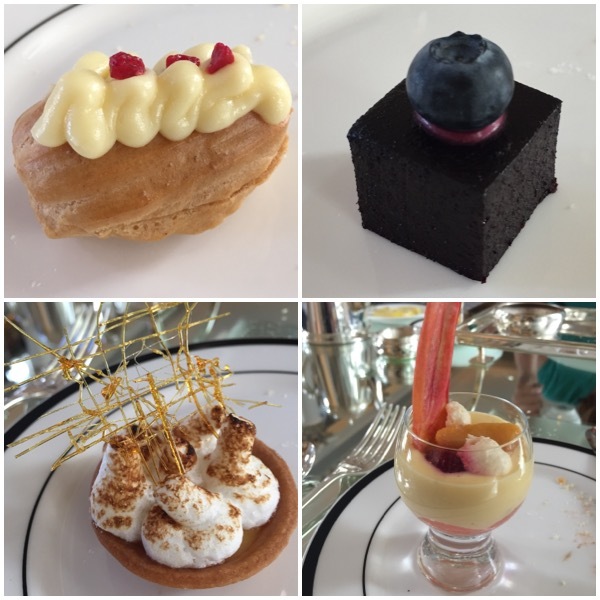 The afternoon tea at the Colonnades is not your run of the mill tea. It’s not cheap but I think it worth it, particularly if you are rather fond of an afternoon tea. 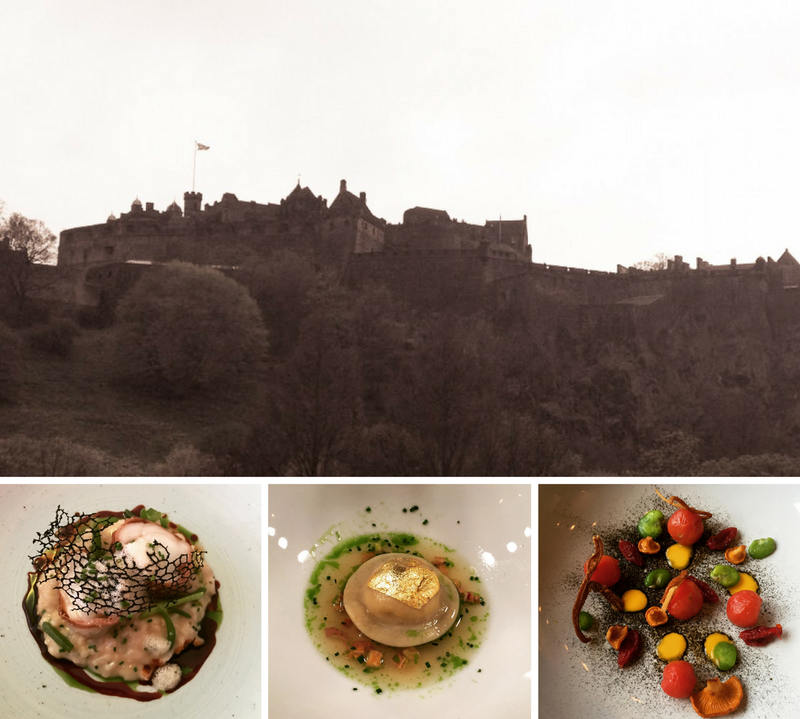 Cost – the meal was complementary but would usually be £30 each. Please note that whilst this meal was complimentary, views expressed are my own. Thanks to Zomato for arranging.